Anne Curtis insists that there's no issue between her and Marian Rivera because of an endorsement deal. 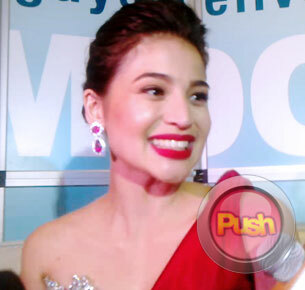 Anne Curtis couldn'rsquo;t help but feel overwhelmed by her grand launch as the newest celebrity endorser of SM Residences at the SMDC (SM Development Corporation) Grand Showroom last January 27. Not only did she arrive in a Rolls Royce, but she also got to wear a stunning Francis Libiran gown as she dramatically descended a flight of stairs before she was serenaded by Christian Bautista on stage. "I think this is the biggest welcome I had in my career (laughs). Super grand'mdash;from the gowns, the car, the arrival, the paparazzi, the cameras'hellip; I never felt like this before. As Mr. Henry Sy Jr. said, a star is born and that'rsquo;s exactly how I felt tonight," she said in an interview with the local press. Anne was definitely given special treatment, fit for a Hollywood star, leaving a lot of people wondering if this would cause conflict between her and Marian Rivera whom she reportedly replaced as SMDC'rsquo;s top image model. Rumor has it that Marian'rsquo;s contract was no longer renewed because of the negative publicity concerning her alleged attitude problem, which may reflect on the company'rsquo;s image. To which Anne replied, "Hindi ko siya pinalitan in all fairness, I was just added to the SMDC family. I think to use replacement is such a'hellip; I don'rsquo;t think it'rsquo;s a word we should use because I did not naman replace her." Despite the intrigues being thrown their way, Anne stressed that there'rsquo;s no bad blood between her and Marian. "Yeah, kami we'rsquo;re fine naman. There has never been an issue so I don'rsquo;t think anyone else should make an issue out of it. I think all of us from the industry, anything that comes our way, we all just consider it a blessing to us because things aren'rsquo;t just handed to us. We all work for it. So I think it'rsquo;s only the people who aren'rsquo;t in the industry who try to make an issue out of it." When told that she could possibly be the next biggest endorser in the country, all Anne could say was that she'rsquo;d try her best to fulfill what'rsquo;s expected of her. "Of course there's pressure. I have big shoes to fill in actually because she is and still is the number one endorser in the Philippines, and she's the one who set the standards for SMDC residences. So I have big shoes to fill and I hope I can meet the expectations of others as well." Keep logging on to Push.com.ph for updates about Anne and her upcoming movie Who'rsquo;s That Girl'rsquo;with Luis Manzano.